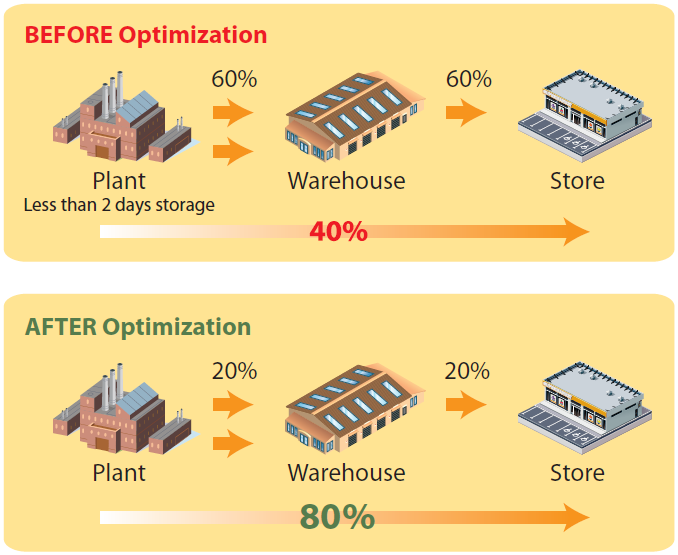 AutoScheduler cuts the cost of operations in a plant, distribution center or a campus of warehouses. AutoScheduler does this by synchronized lean-scheduling all warehouse operations within constraints, such as manpower, thereby eliminating waste at all levels of the operation. Keeping it simple vs. Synchronize - which is better? Eliminating complexity by using simplifications such as "ship everything to an outside warehouse" can be quite expensive. One of our clients learned this the hard way. Instead of maintaining shipments from the plant site, they moved every box 26 miles down the road for storage and later shipping. Analysis showed that 30% could have shipped plant-direct saving $900,000 per annum. Developed in conjunction with Procter & Gamble, it is operating in more than twenty North American and European distribution and manufacturing sites. AutoScheduler is a WMS add-on that uses an expert planning engine to schedule constrained resources, such as dock doors, while “optimally” deploying inventory to meet customers’ needs.